THPBlog: Mendocino Redwood Company to log near an occupied marbled murrelet stand and on steep slopes near Point Arena. Mendocino Redwood Company to log near an occupied marbled murrelet stand and on steep slopes near Point Arena. THP 1-13-060 MEN (South Brushy THP) Mendocino Redwood Company, 163 acres; 53% transition, 47% selection logging. Lower Alder Creek, Mallo Pass Creek (MD: T13N R16W Sec.3, 10). Wet weather operations, high erosion hazard, landslide terrain, steep roads, steep slopes up to 85%, coho watershed, 2 spotted owls within 1.3mi, occupied marbled murrelet habitat below THP, California sedge, Piperia, scattered large trees. Estimated public comment deadline: 09/09/13. 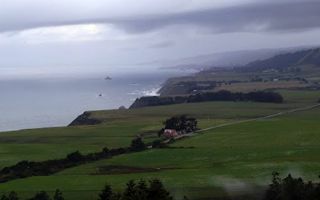 This THP is about 5 miles NE of Point Arena, and a few miles east of highway 1 at an elevation of 500 to 1,600 feet. Mendocino Redwood Company is planning a tractor and cable logging operation in second growth redwood and Douglas fir. Both Mallo Pass Creek and Lower Alder Creek flow into the Pacific Ocean. There are unstable areas in units 2 and 3; an active 7 acre landslide and an active .5 acre landslide. The existing network of skid roads will be used on unstable soils, on slopes over 65%, and on slopes over 50% with a high erosion rating, to log a small portion of unit 2. An occupied marbled murrelet stand called the Lower Alder Creek Marbled Murrelet Management Area, is located just below the THP. A Population of California Sedge was found on a main haul road, and a Piperia plant was found inside a unit off a main haul road. More information is available on the THP Tracking Center website.